These rectangular dining tables are innovatively designed to bring facts and increased awareness to dining rooms in a fun and enticing way. The bright colours bring an element of character to lunch times and are ideal for school dining rooms, cafeterias and canteens. 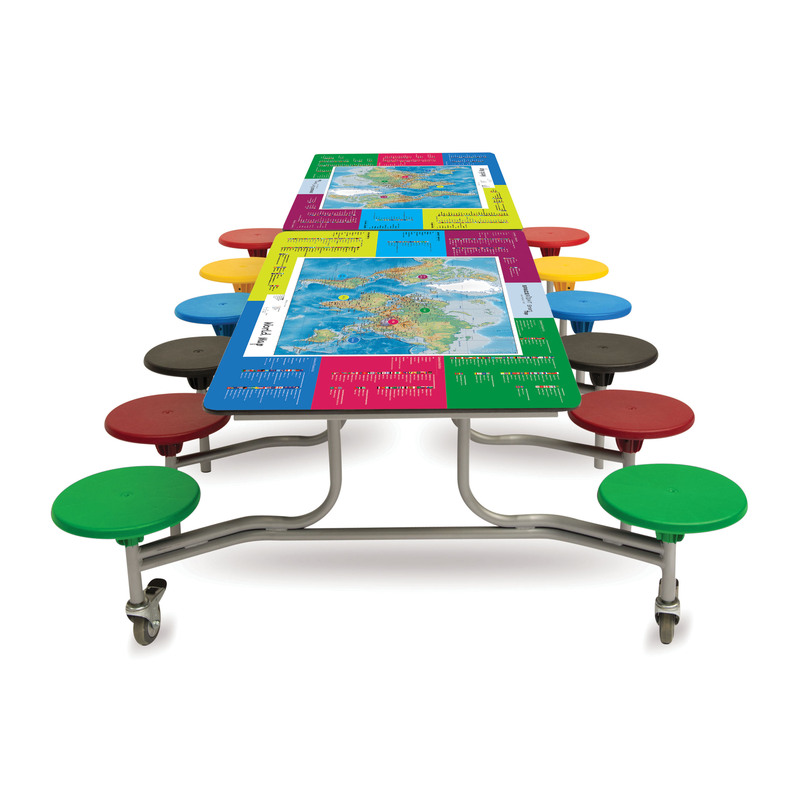 This rectangular folding table seating unit has a unique Smart Top in a choice of themes - endangered animals, world geography and modern history & inventions. Illustrated appropriately, these table tops contain subjects of continuous relevancy to children to aid them in their learning. The world geography mapped smart top complete with country and city detail. 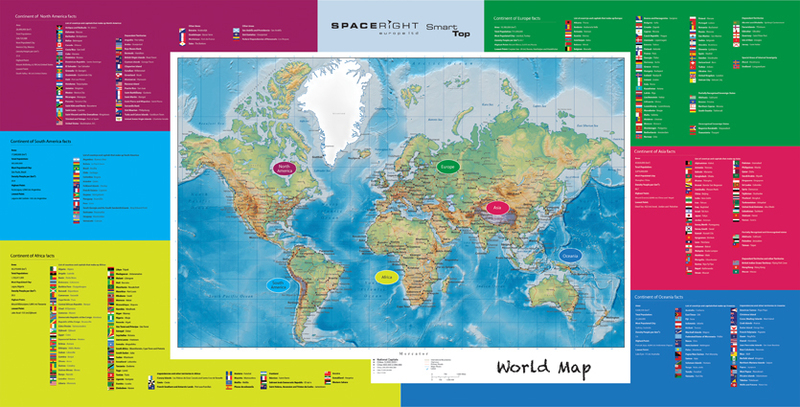 The illustrations around the map is split into continents with appropriate flags for that continent as well as key geographical information for each continent – area, total population, most populated city, population density (km²) and highest and lowest point. The modern history and inventions smart top is illustrated with information on significant world events, inventions, historical and sporting achievements from 5 decades – 1950 to 2000. The endangered animal’s theme smart top has information on the worlds most at risk species including: tigers, rhinoceros, orangutan, elephant, red panda and giant panda. This table top theme gives students an insight into interesting facts regarding a range of animals from all over the world. The table seating unit has 12 seats in a choice of colours and are available in 2 heights – 685mm and 735mm. These heights are ideal for primary and secondary school use as they conform to BS EN 1729 so are deemed to provide appropriate posture and ergonomic comfort for students. There are 10 seat colours to choose from - red, blue, yellow, green, wine, black, lilac, blueberry, orange and apple green. Multi-coloured seats are available on request - call for more information 01733 511121. Table tops are made from MDF and laminated on both sides. All table tops are waterproof and come complete with an ultra-tuff, waterproof rubber edge - both which make for easy cleaning and improved hygiene. When folded all tables can fit through a standard height doorway (1980mm) so no need to tilt tables to move between areas. This enables conversion of school halls into multi-use areas easily and quickly without heavy lifting. 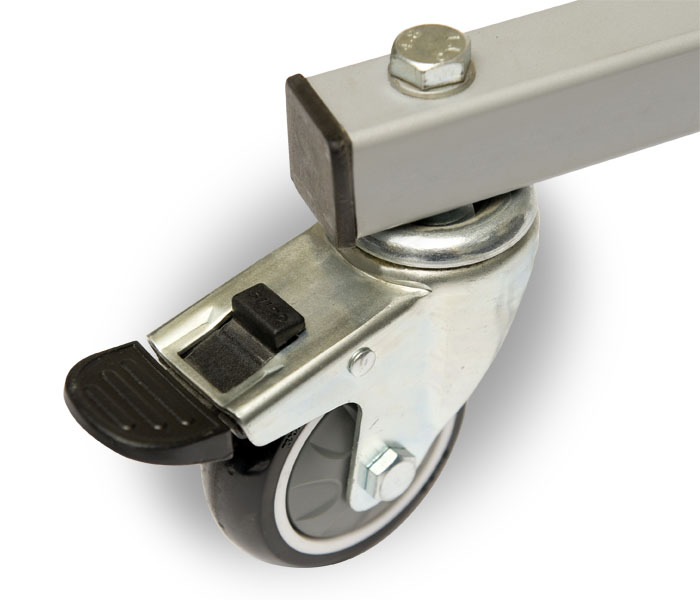 The 4 easy-glide castor wheels also aid in the transporting and storage of these tables. In addition to the stow-away locking position, there are 2 more locking positions. 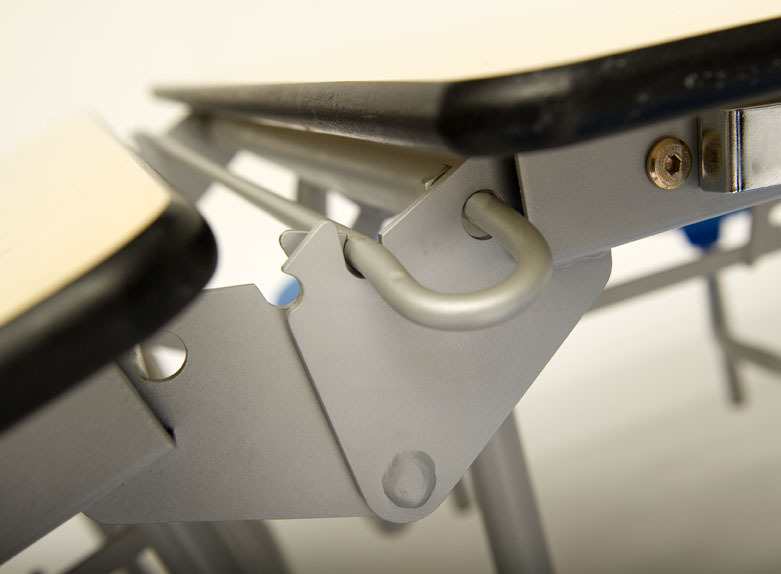 The open position safety lock ensures that the table will not revert back to the folding position and the easy clean intermediate lock helps with cleaning the table top and accessing the floor area beneath for improved hygiene. 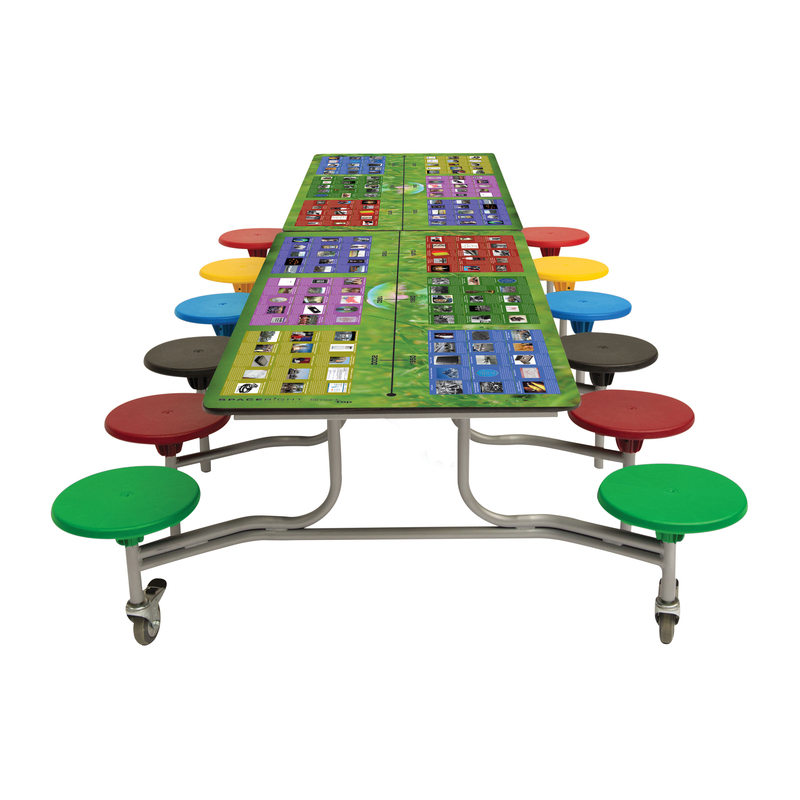 Our mobile dining tables are fully FIRA tested and certified which means they are judged to be sufficiently stable and structurally suitable for use in educational establishments. Here at ELF, we offer a FREE 3D space planning service which aims to create space plans and bespoke solutions for school dining rooms, cafeterias and canteens. In addition, we also offer a FREE site survey service to assess your needs and create the best possible solution for style, quantity and position of the most appropriate dining furniture – contact us for more info on 01733 511121. 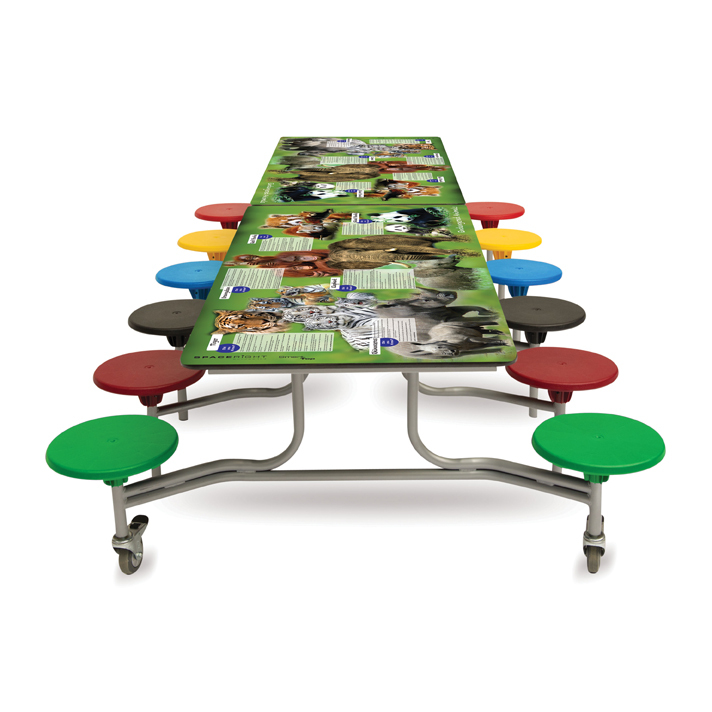 Our folding school dining tables come with a 16 year warranty against manufacturing defect. We can provide a free visit to inspect product damages which will be reviewed on a case by case basis and charges may apply for repair.